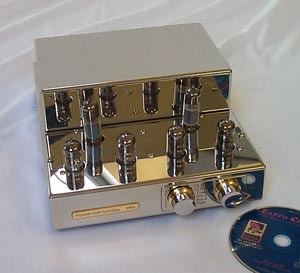 Tube preamplifiers and stereo power amplifiers from Papworth Audio Technology. PPA6 A six input, line level, mono/mono preamplifier, designed to be used with any of the range of tube monoblocks. The circuit uses four pieces of an anode fed cathode follower to give two separate isolated outputs for left and right. All supplies to the tubes are regulated, stabilised dc, with the anode feeds for the anode fed cathode followers having a triode/pentode ECL82 regulator for each pair of tubes. A start up mute is incorporated to allow the dc conditions to settle before the signal is provided to the power amplifiers. Both the gain and selector controls are by Alps, and the specification is fully compatible with the tube monoblocks. The PPA6 chassis and transformer covers are made from two millimeter thick hand polished stainless steel. Front panel logoplates are Pure gold plated, and laser etched. Safety covers and base plates are rust protected and painted in black silk finish. The PPA6 can also drive solid state power amplifiers such as the Papworth MPA-200 or MPA-300, thus making a Hybrid system. This is often favoured by some audiophiles who want to give some warmth to a solid state system. TVA10 This famous identification is for a stereo tube power amplifier that is credited as starting the valve revival in the late nineteen seventies. Original design by Tim de Paravicini, for Michaelson and Austin, and still manufactured by Papworth more than twenty years after it was introduced. This power amplifier has been upgraded over the years to incorporate total reliability, by the inclusion of double sided plate through PCBs, and greatly uprated components. It can deliver 50 watts into either four or eight ohms, from its McIntosh output stage, using EL34 pentode valves in class AB1 push pull. The original circuit and transformer winding detail has been carefully maintained over the years, so that the purchaser can be certain of getting the true formula of one of the famous all time great tube amplifiers. An alps velvet gain control is fitted to adjust system level. 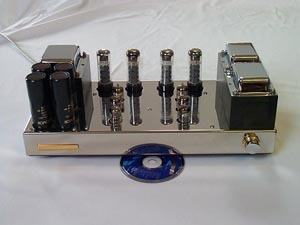 The TVA10 is often purchased as part of a starter system for high end audio. The sensitivity of this amplifier allows source equipment to be plugged in direct without need for a preamplifier. 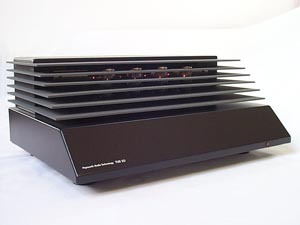 This amplifier is fully capable of driving speakers such as the ATC. SCM 20, or Sonus Faber Minima Amators. TVA50 In the late nineteen eighties the TVA10 was considered in need of restyling, and the electronics of the TVA10 were incorporated into the TVA50 chassis. This modern sculptured Aztec stepped tower is the end result of a design excercise carried out by a well known world class designer. The high technology black stealth finish was well received and good quantities have been sold. However due to the higher cost to manufacture, it is now only built to special order. The electronic specification of TVA50 is identical to TVA10.